Cairo-Indian film of marathi language Redu is one of the favourites to win the top prize, the Golden Pyramid, at the ongoing Cairo International Film Festival. Redu was screened to a packed audience at the Cairo Opera House, the main venue of the biggest film festival in the Arab world.In Redu a nostalgic journey into rural India of the 1970s.Marathi film Redu, directed by first-time filmmaker Sagar Vanjari, tells the story of a middle-aged well digger falling in love with the radio, which was newly introduced to the village in early ’70s. 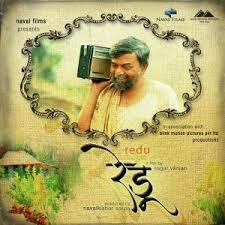 Redu means radio in Marathi.